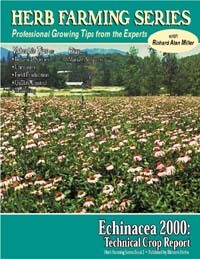 Echinacea is a major medicinal herb crop. It is one of the top ten selling medicinal herbs today for use as an immune-system stimulant and cold and flu preventative. As the world’s population increases and ages, the prospects for this crop will remain steady for many years to come. Richard Alan Miller, American’s leading expert on herb farming, gives a clear and direct overview of the crop and how to grow and market it. There is much valuable information here that is unavailable in other sources, such as up-to-date price and market facts, latest cropping research, and much more. 17 pp. Available in electronic form only. You will download a PDF format file which can be displayed on your computer or printed on your printer using Adobe Reader (available free from www.adobe.com).